A Las Vegas synagogue was full of community members coming together of all faiths to pay their respects to the victim's of the Pittsburgh shooting. 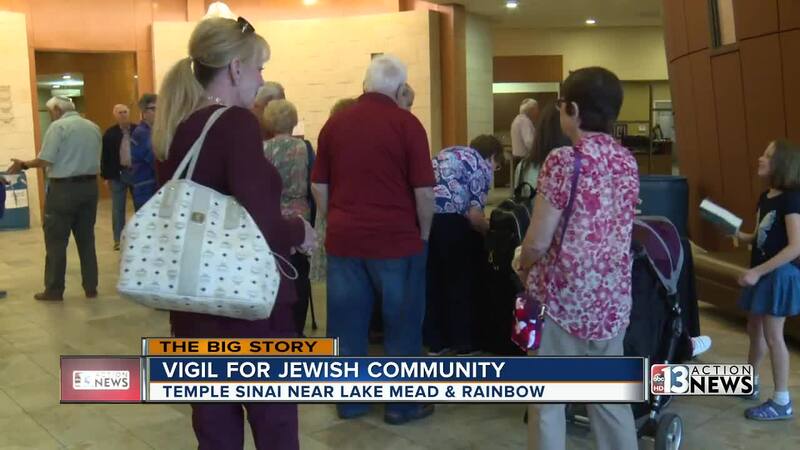 It was a packed house inside Temple Sinai, as dozens of locals gathered inside the Summerlin synagogue to be as one. “People are really hurting, they’re scared, they’re angry and so we wanna give them a chance to come together and express that,” says Malcom Cohen, rabbi. The vigil and service, remembering the 11 innocent lives lost over the weekend, after a man stormed into a Pittsburgh synagogue and opened fire. The vigil was also about empowerment, bringing together the Las Vegas Jewish community as a family. “No matter which temple you go to, on which side of town, or which synagogue, y’all kinda know everyone each other,” says Brian Slipock, attendee. The vigil also bringing folks of other faiths out as as well, hoping to break down barriers and to spread love. “We’re all humans at the end of the day and we should care and love one another,” says Patricia Messer. Attendees say they are going to continue fighting against hate and intolerance. “We’ve survived many attacks and we’re a heathy Jewish community, we are vibrant and we are going to continue to be that way,” says Johnathan Marx, attendee. Another community vigil is planned for Thursday at 6:30 p.m. at Temple Beth Sholom.